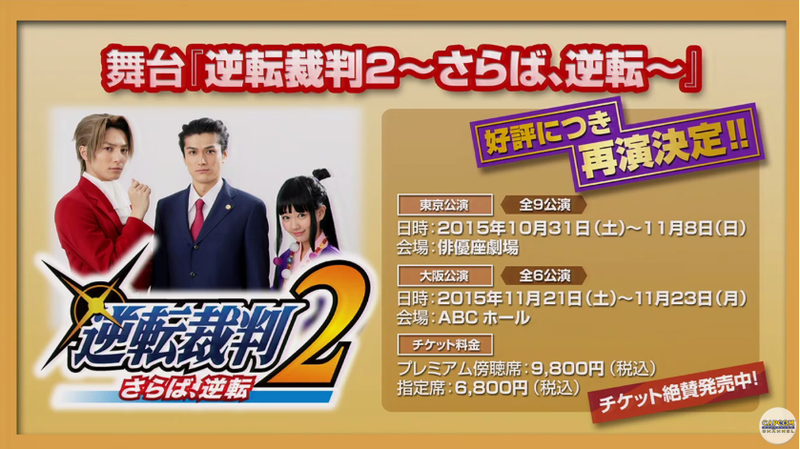 KoopaTV: Ace Attorney: Anime, New Live-Action, and TGS Live Stream Details on Ace Attorney 6! 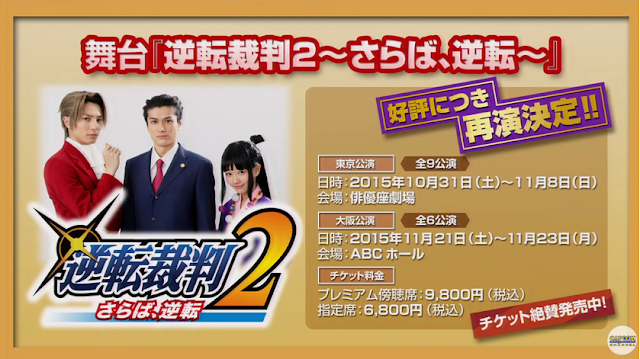 Ace Attorney: Anime, New Live-Action, and TGS Live Stream Details on Ace Attorney 6! By LUDWIG VON KOOPA - The future looks bright for Ace Attorney in the Land of the Rising Sun. So what about everywhere else? Let's end this week with some scrumptious news: Over in Tokyo Game Show land (a very important place that KoopaTV has not covered in our history, so shame on us) the new Ace Attorney 6 was/is playable (it was being streamed, too, which you can watch a replay of here)! Right, we said that'd happen before, but I sorta forgot about it amidst all of the Republican debate stuff. ...Either way, we failed to raise the funds for Kamek to play it, so no on-the-floor Tokyo Game Show coverage this year either. Along with opportunities for folks not employed in KoopaTV to play Ace Attorney 6, there is also now a NEW TRAILER for Ace Attorney 6 (not only new, but... the only one)! Here's a subbed version. You should expect an official dubbed version sometime relatively soon out of CAPCOM. But wait... there's ALSO a lot more. 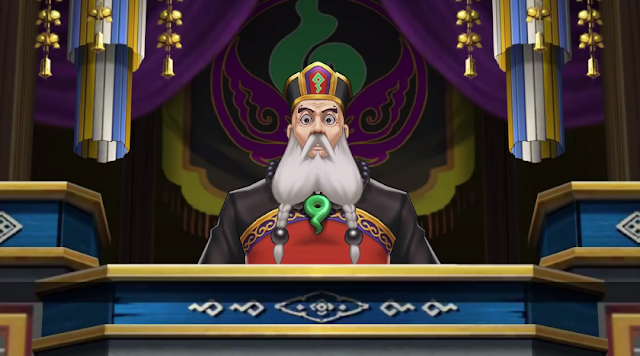 Would like to note that Phoenix Wright has the same model as Phoenix Wright: Ace Attorney — Dual Destinies. So this should be faster to release (sometime in 2016) than the wait for Dual Destinies itself, similar to Justice For All and Trials & Tribulations being shorter waits thanks to reusing the engine and graphics. Commenters on KoopaTV ripped on me for calling the defendant "the new Maya", a "girl", and "she". It is literally wearing a dress and a woman's purse. I'm not respecting this dude's pronouns, so I'll call it what I want. Apparently the backwards kingdom that does things with this Water Mirror is Kurain, or the place that the Fey clan originates from. I'm sure it's not a coincidence. This guy is hiding Dr. Wily-esque cheeks. That can't be a coincidence, either. We still have no idea what Phoenix Wright is so pissed off about, though. Is he pissed off that no one knows wot a defence attorney is and that the Feys could've come from such a stupid lineage? 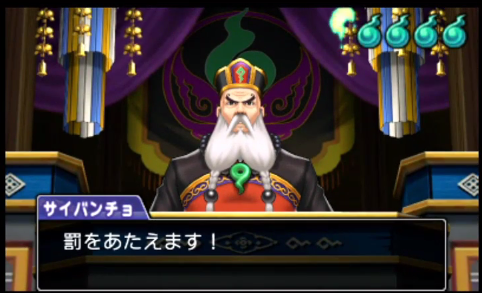 I'm listening to the new cross-examination music right now as the game is playing on Capcom's Toyko Game Show stream. It's nice enough. Apollo is also confirmed to be in the game. Is Wright's anger from jealousy that a Payne is treated like royalty while Wright is treated like the ashes he rises from? The Water Mirror pretty much is the Mood Matrix. Animated flashbacks of a specific moment that you try to confront with logic. Bad logic makes you use part of your five-part lifebar, much like the first Phoenix Wright: Ace Attorney. Meanwhile, also announced at this event is an Ace Attorney anime, coming to Japan in April 2016. 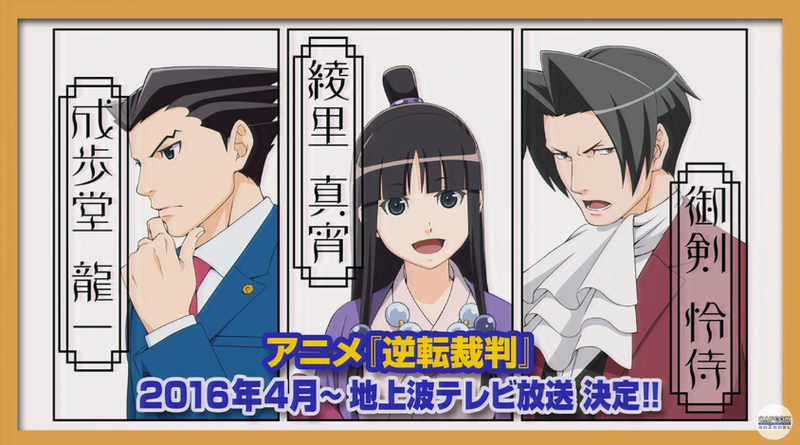 No word on North America, but it will involve Phoenix Wright, Maya, and Miles Edgeworth in some capacity. Will it have original stories like the manga casebook I reviewed? We don't know. But I hope the anime makes Phoenix Wright popular enough to get into Super Smash Bros., much like how many other Super Smash Bros. characters have their own TV shows. Anime Maya is adorable! Wright is portrayed as the first Ace Attorney trilogy Phoenix Wright, so that should give a clue. At the very least, Ace Attorney is popular enough for Capcom to endorse ANOTHER Ace Attorney live-action production. That's right, a second one. ...Still haven't watched the first (a movie), since that's also a Japan-only thing. See? "2"! Second live-action production. Seems like a pricey amount of yen to attend? I dunno. Maya is cute. That's not all. 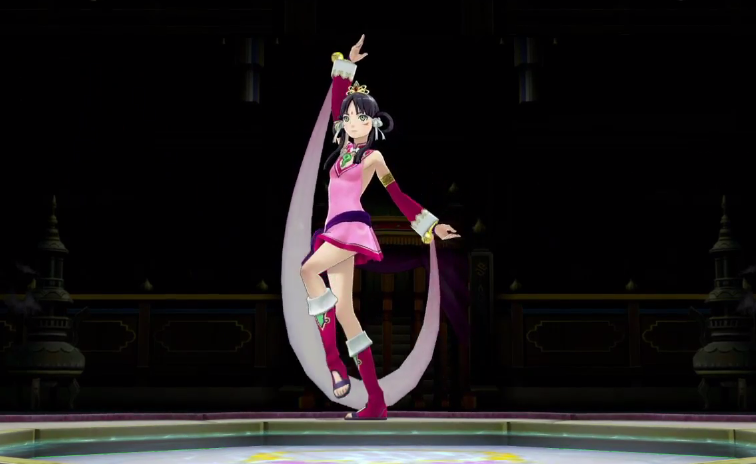 Ace Attorney is also popular enough for a dance skit! Nevermind, this is a cutscene from Ace Attorney 6. Song and dance routine like it's Genei Ibun Roku #FE again. So THIS person is definitely a girl, right? We already know Ace Attorney 6 is coming to America. So we just need Ace Attorney Investigations 2, Great Ace Attorney, this anime, both movies...Yup... Please Capcom? We've been good to you! Ludwig is a huge fan of the Ace Attorney franchise, as people who regularly read KoopaTV would know. He thinks Ace Attorney fans are some of the most fantastic fanbases ever, just below whoever considers themselves a KoopaTV fan. There's definitely overlap, though. Comment on what Ace Attorney thing you're hyping yourself up for the most, ignoring its likelihood to be translated into a language you understand! ...Also if Ludwig has some misinformation, please correct him straight away. Making sense of Japanese can be tough, which is why Ludwig wants a fluent Japanese person on KoopaTV staff. Even better details: Ace Attorney 6 is now Phoenix Wright: Ace Attorney — Spirit of Justice! The Water Mirror is now known as the Pool of Souls. 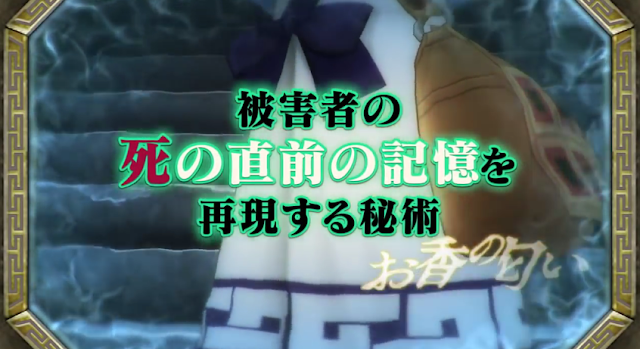 The anime will be dubbed to America! Progress! ...However, Great Ace Attorney, otherwise known as Dai Gyakuten Saiban, is getting a sequel in Japan. One step forward, one step back. The Ace Attorney anime is finally coming to America... January 23, 2018! Hey, the YouTube livestream chat said it was a movie and they seemed to know wot they were talkin' 'bout BUT THEY DON'T. So what was it, one of those stage shows they only do for people actually there (not for us tuning in via the Internet)? tumblr mocked me and said that's why it's so expensive. Y'know, I don't like how doing thing lives commands such a high premium. CDs and songs are cheap. Concerts are expensive. Movies are relatively cheap. Shows and theatre ain't! Supply? They can produce thousands of copies of a single CD, you can get it months later, and then you can listen to it whenever you want, more or less forever. No one would pay too much for something in such ready supply. But for a live concert, you have a limited number of seats for an event only taking place a few times (or once) at a specific time and location. The supply is much lower, so people will pay higher prices. Plus, you know, the value of actually being in the same room as the musicians. And in this specific case, no one not present got to see the Ace Attorney stage show. And maybe we never will. So if you wanted to see it, you had to go right then. Depending on how much you wanted to see it, you might be willing to pay quite a bit. Yes, I know the economics behind why it's a thing. It's more of a comment on how live things aren't worth the money. ...You could consider that an endorsement of Team Science I GUESS. Yeah, I saw the same thing on Capcom Unity. Wot was the team doing since Dual Destinies? They obviously had Europe do Layton vs. Wright. Trilogy was obviously already localised before. Translating AAI2 for that ideal Apollo Justice/Investigations/Investigations 2 collection to bring the full series to 3DS? It'd still make more sense for Apollo Justice, Dual Destinies, and AA6 to be in a collection. While Investigations, Investigations 2, and Great Ace Attorney be in another. For Capcom, I think content makes more sense for their marketing. It's hard for me to get into anime in general so it looks like the Ace Attorney anime may be the one I watch regularly. Of course the most important news of TGS is SPLATOON PLUSHIES AWWWWWWWWWWWWWWWWWWW I WANNA BUY THEM AND HUG THEM AND STROKE THEM. Oops, I know this is getting off topic. I can't help but notice you say that Ace Attorney fanbase is one of the best ever. While I know tons of great individual fans, I had the most horrible experience at the Court Records forum that I fled after making one topic which was my only post ever. It took me a good long time for me to recover enough and to want to sign up at major forums again. I was wary when signing up at Smashboards as an example but I then took the plunge and was glad I did. ...So that begs me to ask, "What was your most horrible experience at Court Records?" Somehow I feel like the Ace Attorney anime will be a 26-episode total kinda thing. And I prefer not posting about my experiences at Court Records out in the open. ...Yeaaaaaaaaaah we need new plushies. We have Ace Attorney foam fingers but not good plushies? Whoops, put that in plural by mistake. And I am not a fan of the official phoenix plushie. Yeah, since when does Wright grin like that? I wouldn't call these very comparable. Chibi-Robo: Little Hope In His Last Chance? Is The Legend of Zelda an RPG? Speaker John Boehner Is Gonna Retire! Is The Wii U "Watchup" News App Worth Your Time? Ominous (Latin) Chanting — Overrated? Shigeru Miyamoto is NOT Bowser Jr.'s Mother! Elect Ledge Trump for President 2016! Ace Attorney 6 Coming to the West!